UPDATE (August 2015): NFL Audio Pass is now part of the NFL Game Pass Domestic Package. You can order or get more info at NFL.com/gamepass. NFL Audio Pass has been discontinued as a stand-alone product. Audio Pass is no longer available. Watch HD replays of every game this season on-demand or to listen live to every game with @NFLGamePass! NFL Audio Pass is available from NFL.com for $29.99 for the entire season, or $9.99 per month. There is also an option to listen to only your favorite team for $27.99 for the season. One of the great feature of NFL Audio Pass is the ability to listen to either team’s radio broadcast, and in some cases, even a Spanish language feed. There are no blackout restrictions, so you don’t have to worry about missing any games. I love to listen to my favorite local announcers instead of the network teams, but one problem I found is that the video from the TV doesn’t sync with the audio stream from NFL Audio Pass. It’s not exactly an uncommon problem, though. You may also have had similar results if you’ve ever tried the same thing with terrestrial radio. I’ve subscribed to the NFL Audio Pass in the past, but decided not to subscribe this season mainly because it doesn’t sync well with the TV video, and I can listen to games with the NFL Moble app. So, if you have NFL Mobile through Verizon on your iPhone or Android, you probably don’t really need this product to listen to the games. Unless, of course, you spend your Sunday at a computer where you don’t have cell or WiFi coverage. 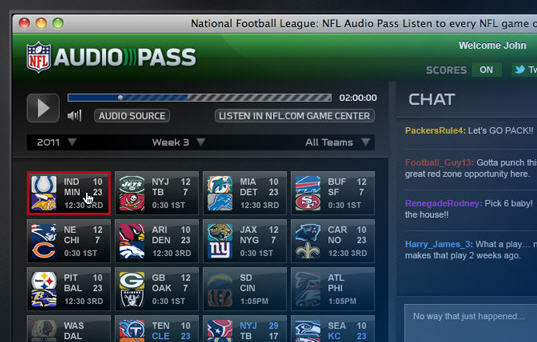 NFL Audio Pass, like all of the other NFL Online products we’ve tried, is excellent. The audio quality is always clear and you can listen to games on demand if you missed them the first time or just want to hear how the local radio team called the game. The UI and functionality is well done and very reliable. Something else we should note is the the Audio Pass subscription is only for the NFL regular season. The NFL has a separate post-season subscription that includes all playoff games and the Super Bowl.